How Much is Your Stuff Costing You? Is your stuff actually costing you money?? Did you know that your stuff can actually cost you? We learned this lesson the hard way when we moved across the country. We were fortunate to have a moving company move our stuff for us, but we had a strict weight limit. If we went over the limit, we would have been charged (a lot) for the overage. We quickly gave away a ton of things and furniture that we didn’t need anymore, and by the grade of God, we were under our weight limit for the move. It took us hours upon hours to just give away the stuff we couldn’t move. We were practically begging people to take our “perfectly good stuff” that we “might need someday.” It cost us the opportunity to try to sell some of our junk, and it completely stressed us out. Extra stress on top of a cross-country move is not a pretty thing. As we started unpacking our boxes, I found all kinds of junk that must have been lurking in cabinets and drawers in our old house. Even after our big purge, we still have a lot of garbage. Opening and unpacking each box is a chore. We will probably be moving again in the next year or two, and I’m hoping our next move goes much smoother because of the Beautiful, Useful Project. 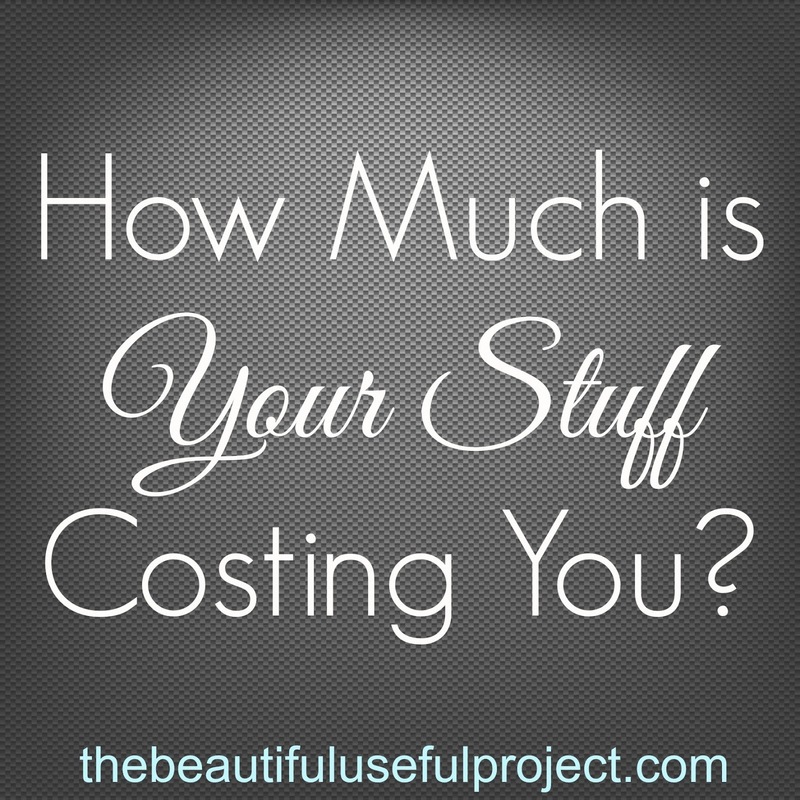 So, how do you figure out how much your stuff is costing you? There are a couple of different ways to go about it. First, you can go through your house and evaluate items one-by-one. Ask yourself if the items are beautiful (to you) or useful. If the answer is no, try to think about how much that item cost when you purchased it. That’s how much it’s costing you, even though that probably isn’t how much its worth anymore. Another approach is to calculate how much each square foot of space in your home is worth. Take the value of your home, and divide it by the square feet in your home. The number you come up with is the approximate cost of each square foot in your home. Now, take a look at all of your storage areas. How many square feet is your junk taking up? Yet another approach is to look at items in terms of emotions. Do certain items that you don’t need anymore garner up certain emotions every time you look at them? I had a bowl that was beautiful, and useful, and made me feel like terrible. It was costing me way more emotionally than it was bringing happiness. The upside to all of this doom and gloom about stuff is that it does get better. I’ve been ruthlessly de-cluttering since we moved in February, and I’ve noticed a huge improvement in the look of our home. It’s certainly WAY far from perfect, but it’s getting better. I used to glance across a room and be annoyed by all of the junk we had. Now the annoyance has subsided. But it’s still there, so I’m off to de-trash yet another moving box! How much do you think your junk is costing you? This post is linked up to Frugal Friday! Years ago, when my husband and I first movedin together, we each had a 1-2 bedroom apartment full of stuff, plus a little storage storage space each. We ended up with a big storage space, packed floor to ceiling. We could not access anything in the storage space without causing an avalanche, so everything in it was basically worthless to us. It was cheap, about $800/year. We did that for three years before I went through it and got rid of things. So we spent $2,400 housing junk we never used again.